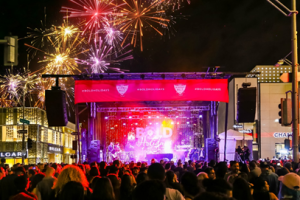 The second annual BOLD Holidays campaign kicks off on November 15 from 5:00 – 8:30 p.m. with the highly anticipated Rodeo Drive Holiday Lighting Celebration. This multigenerational event is brought to you by the Rodeo Drive Committee in partnership with the City of Beverly Hills, Beverly Hills Conference & Visitors Bureau and Beverly Hills Chamber of Commerce. The event will be hosted by TV and social media personality Dawn McCoy. 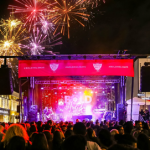 The festivities will include live music from electro hip hop violinist and America’s Got Talent contestant, Svet, and a specially curated 20-piece #BOLDBH band which will be playing a mix of holiday classics and decades hits. Also included will be a dramatic unveiling of the lighting and décor featuring a newly revealed holiday social art installation as well as the debut of artist Alexa Meade’s solo exhibition at 262 North Rodeo Drive which will be open to the public daily (closed Thanksgiving Day) until December 23. Rounding out the evening will be a champagne garden, delicious food trucks, a robust fireworks show and more! programming, beautiful lights and holiday cheer. Guests can enjoy later shopping hours from their favorite merchants while experiencing unforgettable holiday moments featuring larger than life #BOLDBH California snowballs, a live ice sculpting experience, an interactive peace wall, elegant ballerinas performing on top of grand pianos, contortionist fashion art coming to life on the street and much more!